Nusa Penida Island is the largest of three islands off the south eastern coast of Bali, the others being Nusa Lembongan and Nusa Ceningan. The arid island of Nusa Penida is a lime-stone plateau with unreal beauty and white sand beaches. It is one of the three islands just off the southern coast of Bali. Seldomely visited by tourists, and without any permanent tourist infra structure, it is the perfect getaway for those looking for a quiet day without the masses and noises. 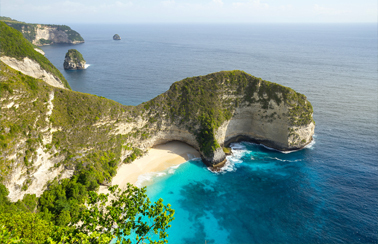 A Nusa Penida Day Tours needs to be on your bucket list. If you are yet to discover Nusa Penida, you are missing out! 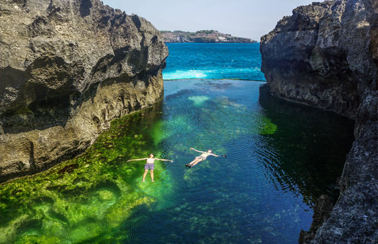 Nusa Penida day trips are a offered from Bali's mailand, with some options, such as; Nusa Penida One Day Tour, and Nusa Penida Tour with Snorkeling. 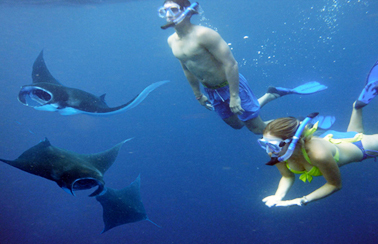 All those package includes round-trip hotel transport, return fast boat tickets, lunch comfortable air-conditioned car or minivan during on Island trip, all the gear (mask, snorkel, fins), with experienced snorkeling guide. A popular snorkeling and diving destination, Nusa Penida has a natural beauty, spectacular coastlines and earthy ruggedness that is an eye opener to any seasoned traveller. Nusa Penida is relatively undeveloped from a tourism perspective. A Nusa Penida Day Trip is a “MUST do” if you are keen for adventure and appreciate amazing landscapes. Some of the key sights to see are Kelingkling Beach, Broken Beach, Angels Billabong, and Atuh Beach. We also include the Goa Giri Cave on the options east island trip. Goa Giri Cave is a “secret” temple hidden in the hill side which holds strong religious cultural beliefs and is a truly spiritual experience.
" The new golden egg of Bali " with our below packages!